President Trump announced Thursday the rollout of a new health care initiative for U.S. veterans: an advancement in telehealth services. "We're expanding the ability of veterans to connect to their Veterans Affairs healthcare team from anywhere," said Trump, adding that he expects the new VA tools to make a big difference, "especially in the area of mental health and suicide prevention." Bottom line: "It will make a tremendous difference for the veterans in rural locations in particular," said Trump. "We will not rest until all of America's great veterans can receive the care they so richly deserve." VA video connect: Health care providers can now treat their patients via video, regardless of location. 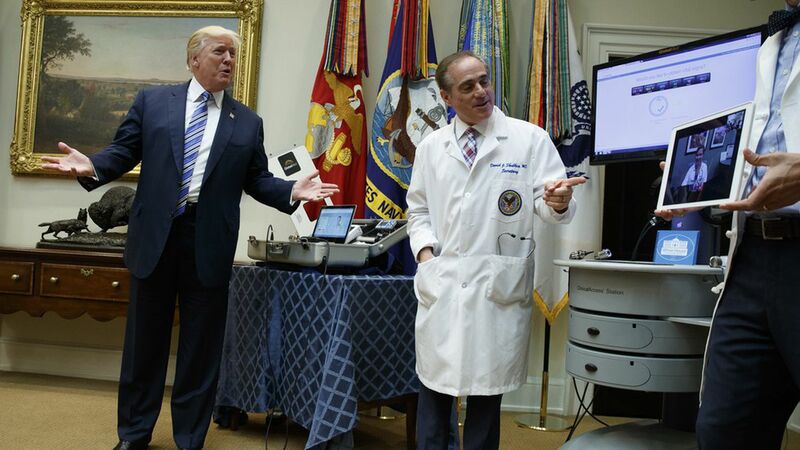 (Trump and VA Secretary David Shulkin did a demo). A new telehealth website enables veterans to compare wait times and quality of care at VA facilities. Telehealth app lets veterans make appointments from their smartphones.